This site is mostly about how to decide whether an African Pygmy Hedgehog is the right pet for you, and if so, where to get one and how to look after it. We love hedgehogs so much and even though it is illegal to own a wild hedgehog as a pet – we still give some guidance on how to care for our endangered friends who come and go from your back garden. 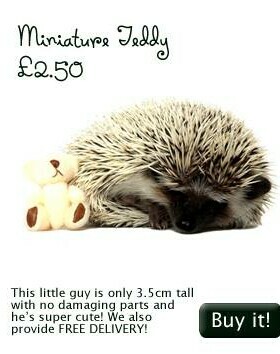 It is important to know the difference between wild and pygmy hedgehogs as they have very different needs. 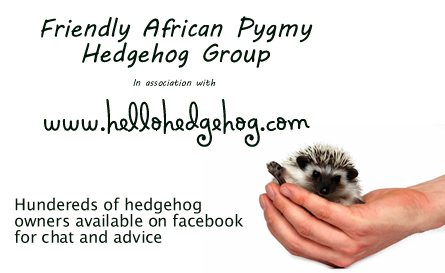 Join our facebook group and chat to hundreds of other hedgehog owners. 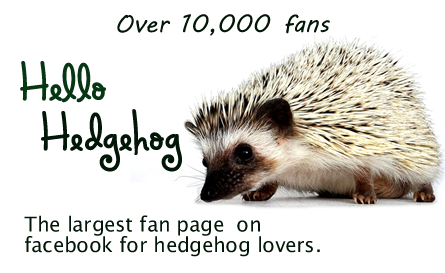 We have over 10,000 fans on facebook and share only the cutest photographs of hedgehogs! 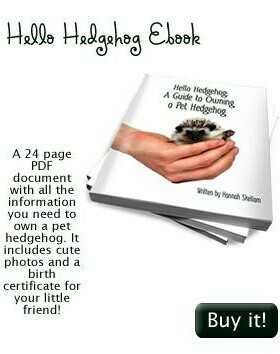 A 24 page PDF document with all the information you need to own a pet hedgehog. It includes cute photos and a birth certificate for your little friend! Hello Hedgehog is a website that will help you decide if an African Pygmy Hedgehog is the right pet for you and if so we can direct you to the best breeders and products for your new little friend. 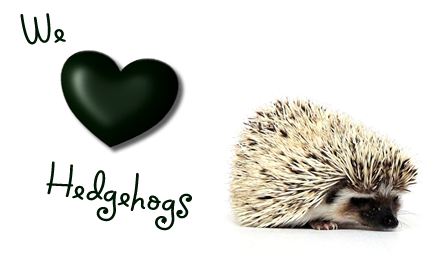 We give you all the information you need about buying a pet hedgehog and how to care for it. You can chat with other users or ask advice in our forum. An African Pygmy Hedgehog is a small animal, they have a cute, furry face with a long muzzle/snout, medium sized eyes , small ears and mouth with whiskers around its nose. They have four legs and a small tail (usually not visible). Its body is covered with about 6000 spikes (quills). They come in loads different colours and patterns. They weight about 1lb and can be between 5 – 12 inches long. When these little critters feel threatened, they roll into a ball to protect themselves. They live between 3 – 6 years. These cuties are not domesticated animals BUT, luckily for us, the Pygmy Hedgehog can be raised domestically in captivity and tamed. This makes them a super cool pet to have. In some areas of the United States you need a permit to have a Pygmy Hedgehog as a pet. In the UK it is legal; however it is definitely not legal to have any other type of hedgehog as a pet due to other types of hedgehogs being wild and endangered. An African Pygmy Hedgehog is a hybrid of the Algerian and Four Toed Hedgehog’s found in the wild, their natural habitat is Grassland, Scrub areas and Savannahs. They’re omnivores (eating a wide variety of foods including slugs, worms, insects, plants, fruits, lizards, mice, frogs, eggs, vegetation and fungi. YUK!) They like to live and hangout on their own, hiding and sleeping under leaves, rocks, in tree roots, logs and holes. Other types of pet hedgehog include the Long Eared Hedgehog and the Indian Long Eared Hedgehog. An African Pygmy Hedgehogs scientific name is Atelerix meaning “ineffective fighter. Its species name is Albiventris meaning “White belly”. Together that means “ineffective fighter with a white belly”. Why now get your little friend a little friend of their own? Some hedgehogs love to carry soft toys about with them. Our teddy is safe for hedgehogs as it doesn’t have any dangerous parts. 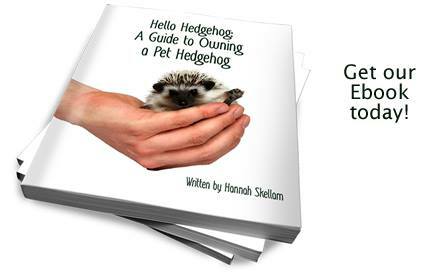 Our Hello Hedgehog Ebook is only 99p and is packed full of useful tips and information about caring for your African Pygmy Hedgehog.